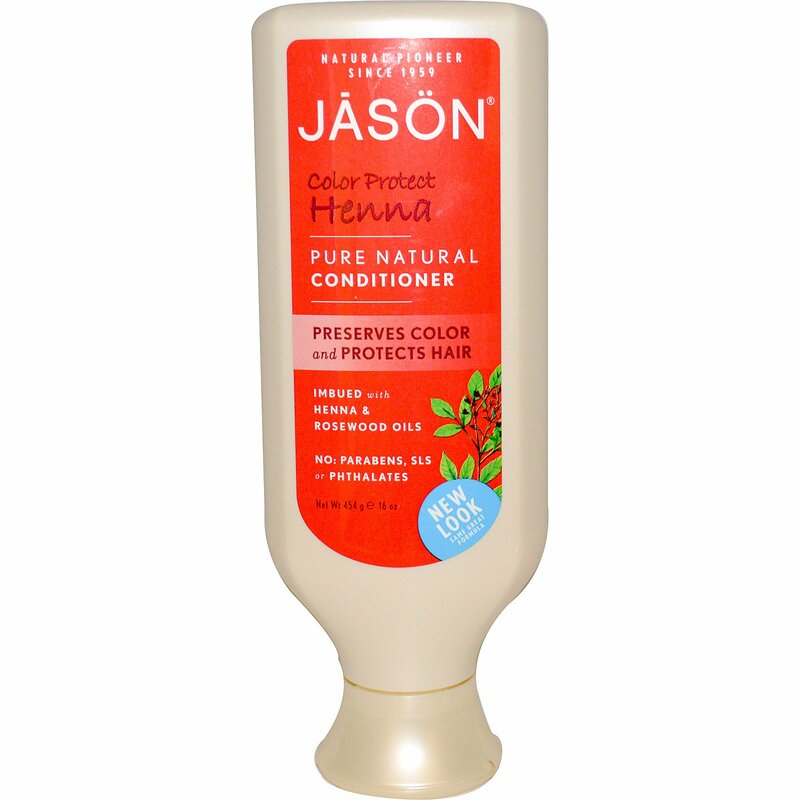 Our Pure, Natural Color Protect Conditioner gently hydrates color-treated hair to preserve beautiful, lustrous color. Strengthening Henna and antioxidant Grapefruit Extracts fight fading while nourishing Wheat Protein, Jojoba Seed and Rosewood Oils give hair a silky luster. Protected and revived, your hair's brilliant color shines through. Born in 1959, Jason was one of the first to offer natural products without harsh chemicals. For 50 years, we have delivered wholesome, no-nonsense, natural products that happen to really work. Our products don't contain petrolatum, sodium lauryl or laureth sulfates (SLS), parabens or phthalates. And we never test our formulas on animals. We invite you to try our entire line of safe, effective, body-loving products. 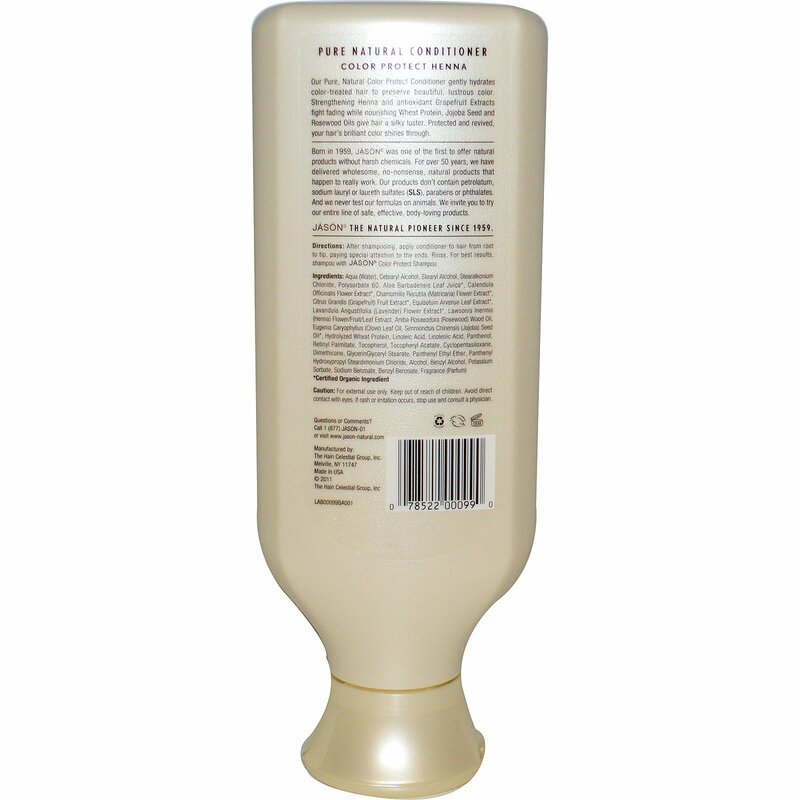 After shampooing, apply conditioner to hair from root to tip, paying special attention to the ends. Rinse. For best results, shampoo with Jason Color Protect Shampoo. Aqua (water), cetearyl alcohol, stearyl alcohol, stearalkonium chloride, polysorbate 60, aloe barbadensis leaf juice*, calendula officinalis flower extract*, chamomilla recutita (matricaria) flower extract*, citrus grandis (grapefruit) fruit extract*, equisetum arvense leaf extract*, lavandula angustifolia (lavender) flower extract*, lawsonia inermis (henna) flower/fruit/leaf extract, aniba rosaeodora (rosewood) wood oil, eugenia caryophyllus (clove) leaf oil, simmondsia chinenesis (jojoba) seed oil*, hydrolyzed wheat protein, linoleic acid, linolenic acid, panthenol, retinyl palmitate, tocopherol, tocopheryl acetate, cyclopentasiloxane, dimethicone, glyceringlyceryl stearate, panthenyl ethyl ether, panthenyl hydroxypropyl steardimonium chloride, alcohol, benzyl alcohol, potassium, sorbate, sodium benzoate, benzyl benzoate, fragrance (parfum).